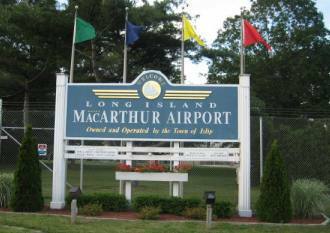 Macarthur Airport is located on Long Island in Ronkonkoma, Suffolk County, New York. It is owned and operated by the Town of Islip. It is also referred to as Long Island Macarthur Airport, (and some people call it merely "Islip Airport") it is the only airport in Suffolk or Nassau County with scheduled service on major airlines. It serves over 2 million passengers a year. The airport began in 1942 as three paved runways built by the Civil Aeronautics Administration (predecessor of the Federal Aviation Administration) during World War II. Lockheed Aircraft Corporation built the first hangar at the airport in 1944. The Town of Islip built a terminal in 1949, after taking the airport back from the Army Air Corps at the end of the war. Through the 1950s, Macarthur was used by Sperry Corporation for aviation research. Allegheny Airlines was its first commercial airline in 1960, offering flights to Boston, Philadelphia and Washington. The Douglas Macarthur terminal was completed in 1968 and American Airlines began operating non-stop flights to Chicago in 1971. 2004 Growth: A total of 114,000 sq. ft were added to the passenger service area of Macarthur Airport with the completion of the Veterans Memorial Concourse. This $60 million expansion hosts four passenger gates, a new aircraft parking apron and additional security screening areas. The Veterans Memorial Concourse also includes elevators and escalators, administrative offices, public restrooms, one newspaper/gift shop and four restaurants. Phase II of the project, expected to be completed in mid-2006, includes the addition of four more passenger gates and a link the Macarthur Airport Main Terminal. Passenger Volume: Over 2.1 million passengers passed through the Airport in 2005, an average of more than 5,800 per day. It is projected that 2.2 million will travel through the Airport in 2006. Number of Flights: 92 flights per day.